Endless Waves of Aliens? Big Guns? A BOOMBOX? Let Them Come has everything you need to recreate a great Rambo in space story, after all they drew first blood right? While I am pretty pumped to start mindlessly mowing down hordes of ugly looking aliens what intrigues me most is how great this game looks being made in GameMaker. The dynamic lightning, the weapons effects, the sound and music, all of it looks well done and really shows off how powerful great design can be with GameMaker. I received an excellent technical write up from Klemen Lozar, the lead developer himself, on some of the challenges in making this game which we will go through piece by piece in a few minutes, but lastly just some launch time information: Launching on Steam and Xbox on Oct 3rd, with plans to launch on PS4, iOS and Android in the coming weeks; visit their website at: let-them.com; and check out their twitter: @LetThemCome . “Every creature in Let Them Come uses 3 unique texture sequences to achieve the final look. With a total of 14 enemies and 5 bosses this seems like a lot. However, the textures, as described with examples below, ultimately combine with shaders to bring a lot of utility and add extra eye candy to the game that would otherwise require even more sprites to achieve. Getting a game to look and play good is only half the battle, getting it to run on all platforms that you want is the other half. Using as many techniques as possible to get performance as high as possible is recommended so the mentioning of difference optimizations is appreciated here. Now I thought it was interesting that the rotation was built into the sprite animation sequences instead of being procedural but the performance savings are a huge point, especially if you are targeting multiple platforms. “To avoid having to create multiple unique sprite sequences for different damage stages Let Them Come uses a procedural damage model achieved with a shader. This requires another unique sprite sequence per creature, UV texture. The UV texture, as seen above, is used to map other textures to the original motion of the sprite. This can be used to achieve all kinds of effects, in my case to signify the health of enemies and depict different damage types, like fire and electricity. In a shader this can be done quite simply by replacing UVs of the original base texture with the xy coordinates of the dedicated UV map. 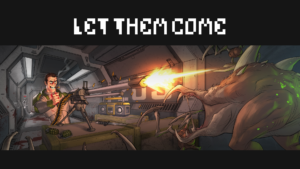 Let Them Come represents two years of constant work by Indie Developer Klemen Lozar who also founded the Indie Development Company TuataraGames. It is always great to see a developer follow through on creative work and it is even better when that creative work is done in GameMaker as it adds another example of what can be accomplished. I applaud Klemen and hope everyone takes a look at Let Them Come.